Born in Aix-en-Provence, France in 1951 where she won a premier prix at the conservatory, Jöelle Léandre continued her studies at the Conservatoire de Paris where she won an additional premier prix. 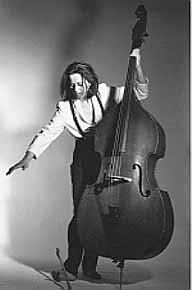 Her devotion to new literature for the double bass has led to awards for study with Mauricio Kagel, John Cage, Morton Feldman and Merce Cunningham. She has appeared as a recitalist and soloist with orchestras and chamber ensembles throughout Europe and the U.S. Her extensive recording credits include a solo album of her own compositions Jöelle Léandre - Contrebassiste. As a composer she has written scores for the theater and ballet as well as several major works for the bass. Octobre was written in 1989 especially for this album and is dedicated to Frank Proto.